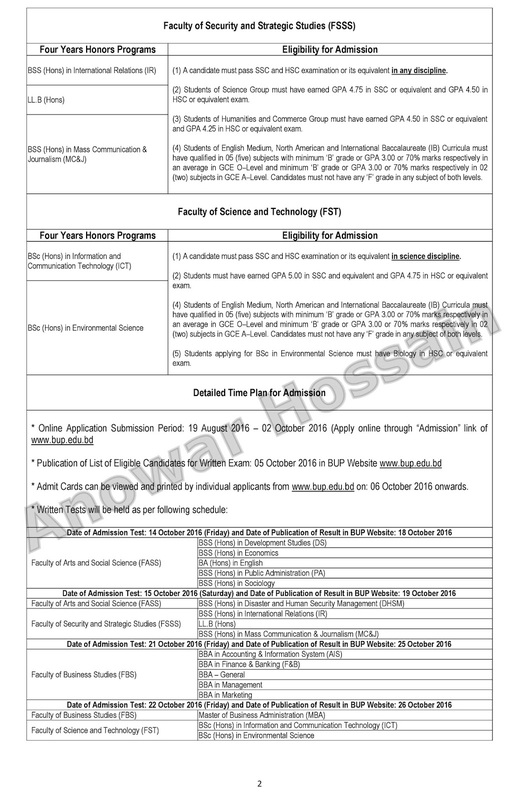 Bangladesh University of Professionals (BUP) Admission Test 2016-2017. The BUP Admission Circular 2016 and BUP Admission Test Result 2016 With Details Process available Here. BUP Admission Official Website is www.admission.bup.edu.bd. Dear all students you are come to right place to get Bangladesh University of Professionals (BUP) Admission 2016-17 information. We are hardly trying to provide your most desired and required University Admission information. BUP Admission 2016 Notice, Seat Plan, Admit Card and Admission Test Result 2016 are found at AllExamResultBD.Com. 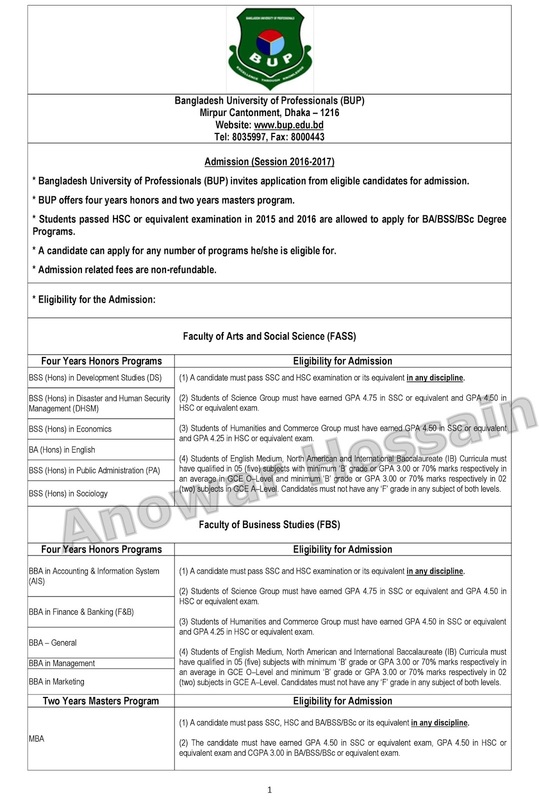 Bangladesh University of Professionals (BUP) invites application from eligible candidates for admission. BUP offers four years honors and two years masters program. Students passed HSC or equivalent examination in 2015 and 2016 are allowed to apply for BA/BSS/BSc Degree Programs. A candidate can apply for any number of programs he/she is eligible for. Admit Cards can be viewed and printed by individual applicants from www.bup.edu.bd on: 06 October 2016 onwards. Date for Viva–voce: 01 November to 22 November 2016. Date of Publication of List of Selected Candidates for Admission in BUP website www.bup.edu.bd : 28 November 2016. Admission from the list of selected candidates: 29 November to 08 December 2016. 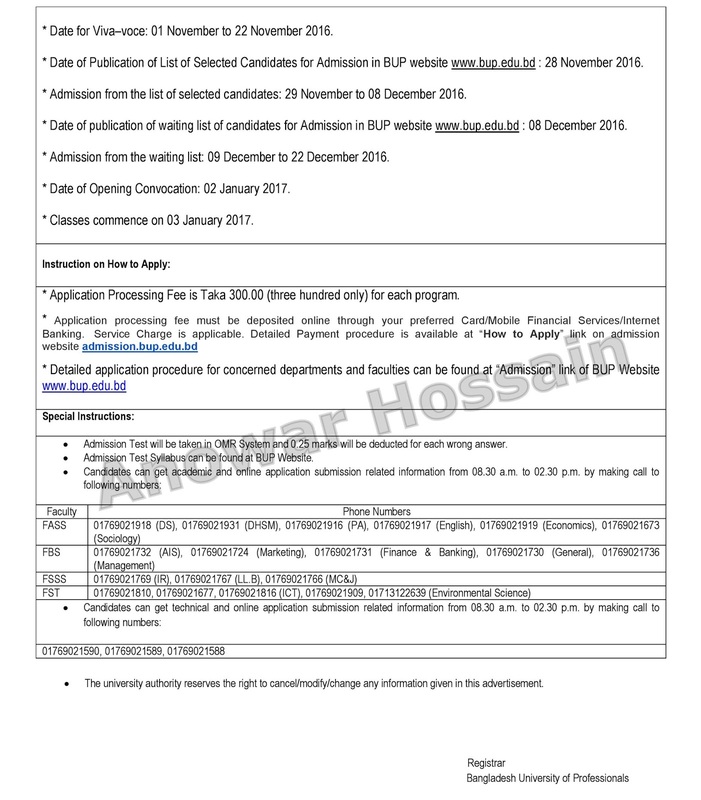 Date of publication of waiting list of candidates for Admission in BUP website www.bup.edu.bd : 08 December 2016. Admission from the waiting list: 09 December to 22 December 2016. Date of Opening Convocation: 02 January 2017. Classes commence on 03 January 2017. Application Processing Fee is Taka 300.00 (three hundred only) for each program.